Sleaford Castle was built during the reign of King Stephen (1135-1154) by Alexander, Bishop of Lincoln. Stephens claim to the throne was contested by his cousin Matilda and many of the barons (including Alexander) sided with her against the King. As a precaution against attack during the civil war which followed, the Bishop protected his estates with a series of castles. Sleaford was probably the most heavily guarded of these. The castle stood some distance to the west of the medieval town of Sleaford, and was approached along a causeway built up above the level of the surrounding fenlands. Although Galley Hill (to the north) might have commanded a better view of the surrounding countryside, the flat fenlands would have made it very difficult for an enemy to approach Sleaford Castle unseen. 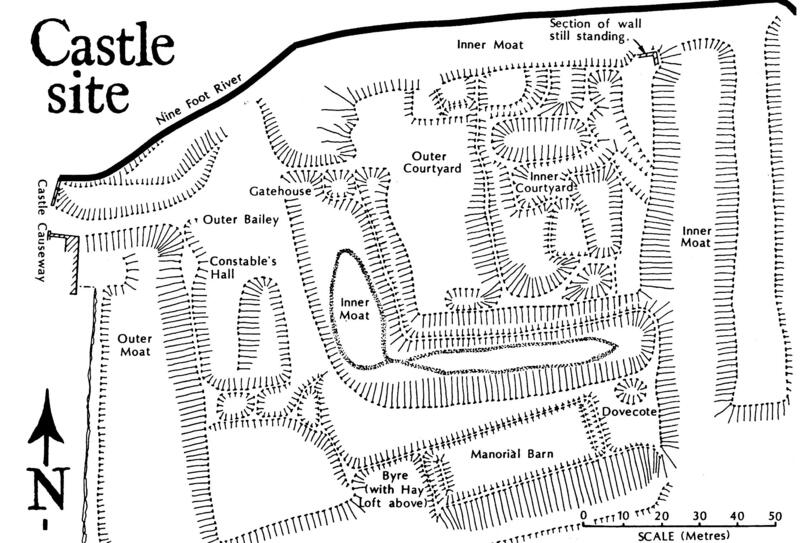 A large pond (formed by damming the River Slea at the end of Westgate) stood immediately beyond the Castle gates and provided it with some protection on the western side, besides being a source of thatch and rushes, fresh fish for the Lords table, and power for a two-wheeled watermill behind the dam. However, for most of its history the Castle was principally a manor house rather than a military stronghold. It was used to store the Bishops produce, administer his estates and provide accommodation for him when he visited the area. The Castle may have even replaced an earlier moated manor house on the same site. Besides the Bishop, the Castle also played host to royal visitors occasionally. Henry VIII may have held a Council here when he visited Sleaford with Queen Katherine Howard in 1541. In 1251, King John spent one night of the last nights of his life at the Castle, after the disastrous loss of his baggage train in the Wash. He was already gravely ill, and the letting of blood by his doctors can have done little to improve his condition. In the event, after one night at Sleaford, he managed to struggle on to Newark Castle, dying there a few days later. The Castle was divided into two main fortified areas or "baileys". A double moat defended the Inner Bailey, which was divided into two courtyards. Any enemy approaching it would have to cross the outer and inner moat (the latter protected by a drawbridge) and then scale two large walls: the curtain wall around the outer courtyard and then impressive inner defences, dominated by the keep or donjon. This would have contained the original great hall of the Castle, some of the Bishops private chambers, and accommodation and an armoury for the Castle guard. The chief tenants of the Bishop held their land from him by "Knight's fee", which meant that they had to provide him with men to do guard duty at Sleaford Castle. This obligation extended to tenants as far away as Bedforshire and Leicestershire. At times of danger or unrest (such as the 1320s), the Castle was often taken under the King's direct control (because he did not trust the Bishop) and reinforced with additional guards. In the event, however, it never once came under attack from an enemy. The Outer Bailey was an island of land outside the Castle walls, defended only by water. Here stood the main manorial and agricultural buildings of medieval Sleaford. The massive manorial barn was in many respects the most important building in Sleaford. It measured about 40 metres from end to end and was at least 15 metres wide. When Robert Carre dismantled it for stone and roof tiles in the middle of the 16th century, it was said to be the largest barn in the country. In the medieval period, the roof was thatched. Holes cut in the walls allowed a flow of air to ventilate the contents, stored in bays inside. The area immediately behind the great doors was used as a thrashing floor. In this barn went all the produce from the lands farmed directly by the Bishop in Sleaford, Boughton and his other neighbouring estates, laboriously carted there along the causeway by the tenants as part of their manorial dues to the lord. The barn's position inside the Castle's outer defences was no coincidence, because its contents represented a considerable proportion of the Bishop's local wealth. After the harvest of 1323, for example, 40 quarters of wheat, 170 of barley and oats and 40 of legumes passed through it; collected at harvest, stored, threshed, and then removed for sowing, consumption or sale as required. (A quarter of wheat weighed about 480 lbs.) Some of the barley was used for brewing. Much of the rest was milled at the town's numerous water mills and baked for bread in the Common Bakehouse on Westgate. The hay harvest also went into the barn. So too did the annual gathering of reeds and rushes cut in the fen and from the pond (some 13000 sheaves in all), which were used for thatching roofs. Attached to the barn was a byre or cattle shed with a hay loft above it. This was used for the draft animals - both horses and oxen - which pulled the demesne ploughs on the Bishop's land. At the eastern end of the Outer Bailey stood a manorial dovecote, where doves and pidgeons were raised to help provide meat for the Bishop's table. In an era when most meats had to be salted to preserve them and even then were often rancid, many birds not now considered edible, were regularly consumed. The administration of the manorial part of the Castle's affairs was the province of the Constable of the Castle, whose hall stood in the outer enclosure. He was assisted by a reeve (elected from among the tenants but paid by the lord) and a bailiff. There were also a number of other paid servants for farm duties, such as labourers, millers and a shepherd. Sleaford Castle has been in ruins for over 400 years and was first dismantled as a source of building stone in the late 16th century and continued to be used for this purpose throughout the following centuries. In 1720 parts of the walls and towers were still standing but all that remains now above the ground is a corner of the north eastern tower which partially collapsed and is supported by a concrete pillar. The foundations of walls and buildings have become overgrown. Below is a sketch of Sleaford Castle in 1720 which has been reproduced from E. Trollope's "History of Sleaford in 1872". 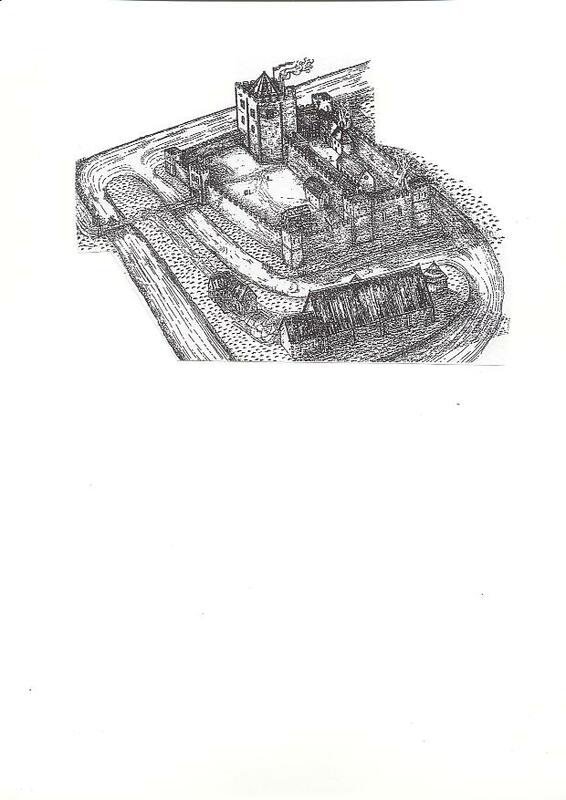 Below is a Reconstruction Drawing of Sleaford Castle by David Taylor.